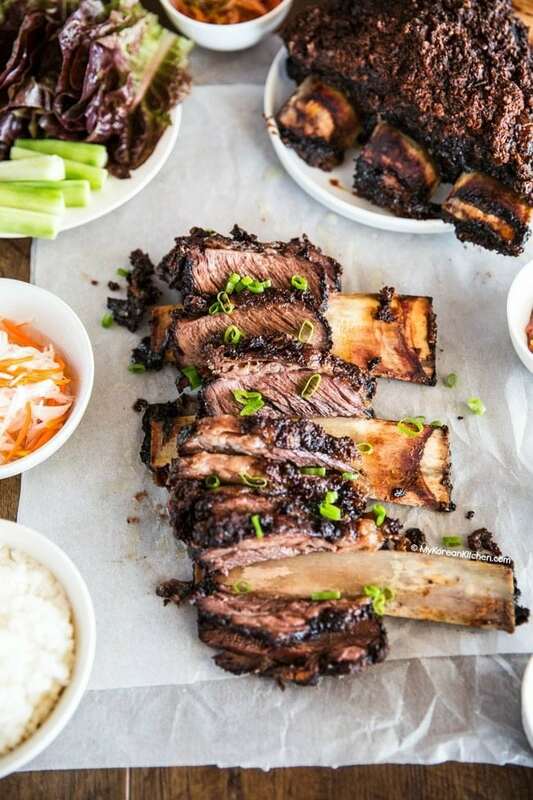 Try these supremely tender and delicious oven baked Korean BBQ beef ribs! They are a crowd pleaser and great to serve on special dinner occasions! With the festive season approaching, I’ve been getting requests for Korean foods that are suitable for hosting a party. In case you don’t know, I have a huge recipe collection for Korean party food, so you should definitely check that one out! 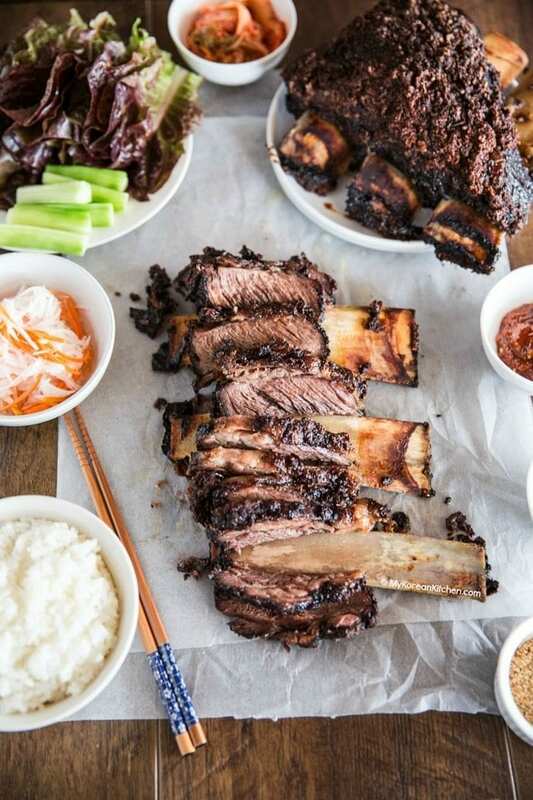 And to this Korean party food collection, I’d like to add today’s special recipe – Oven Baked Korean BBQ Beef Ribs. Until a few weeks ago, I had never bought a rack of ribs to cook at home. I thought these were something you would only eat at a restaurant because they are difficult to cook with. But boy! I was wrong. Contrary to my belief, these ribs are so easy to cook. Another thing to note is these oven baked Korean BBQ beef ribs are so tender. They are slow cooked at a low temperature (100 degrees Celsius/212 degree Fahrenheit) for 8 hours!!! The recipe is super easy and simple as well. Simply prepare the marinade by blending the sauce ingredients in a blender or food processor – marinate the ribs in the sauce for at least 4 hours (but ideally for 24 hrs if you want to make the meat fall easily from the bone) – cook the ribs in the oven for 8 hours. Voila! There you have it. 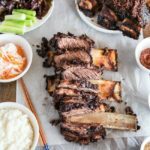 These baked Korean BBQ beef ribs are totally appropriate for special occasions such as Thanksgiving day, Christmas and New Year’s day. Or even a date night! You will be a popular host. So try them soon and let me know what you thought of them! *This marinade is the same marinade I use for Bulgogi (Korean BBQ Beef) recipe. 1. Pour the marinade over the meat and make sure it’s reaching all parts of the meat. Cover the meat and transfer it to the fridge. Marinate the meat for at least 4 hrs (but ideally for 24 hrs for optimal results). 2. Preheat the oven on 100 C/ 212 F (on fan forced setting) for 20 mins. Lay down some waxed baking paper (or aluminium foil) on a baking sheet (or roasting pan). Then place the marinated rack of ribs. Splash some marinade around the ribs but discard most of sauce. Cook it for 8 hrs. 3. Take the meat out and carve. Serve. 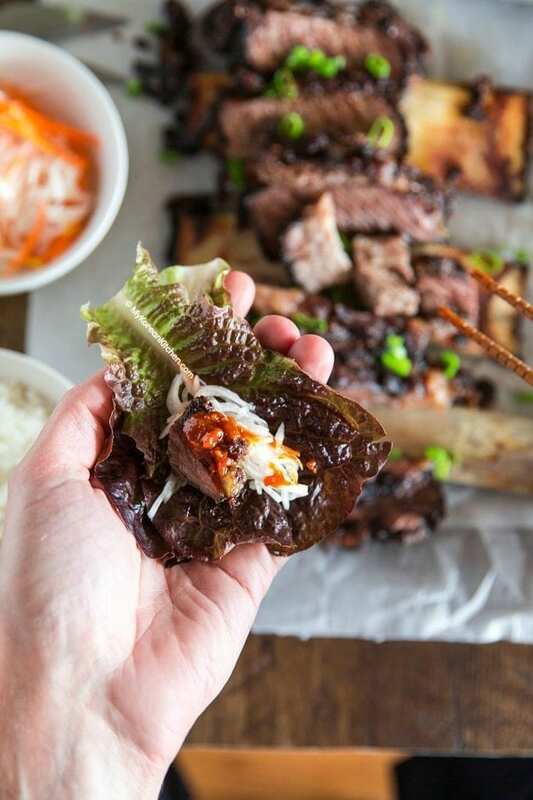 As with a typical Korean BBQ, these baked beef ribs are great to serve with some steamed rice, kimchi, lettuce leaves, and Korean spicy dipping sauce. I also specially made some pickled radishes and carrots to go with it and it complimented these ribs very well! Typically the membrane is removed prior to cooking ribs and here’s how. If you don’t, there will be a rubbery part you will reluctantly chew through or discard during the meal. 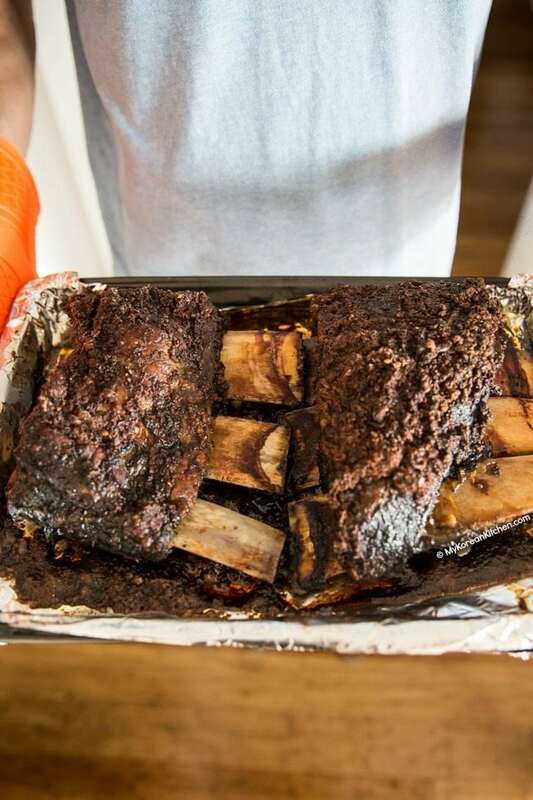 How to make supremely tender and delicious baked Korean BBQ beef ribs in the oven! Pour the marinade over the meat and make sure it’s reaching all parts of the meat. 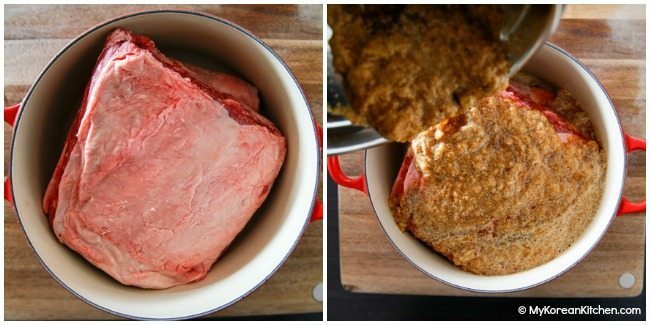 Cover the meat and transfer it to the fridge. Marinate the meat for at least 4 hrs (but ideally for 24 hrs for optimal results). Preheat the oven on 100 C/212 F (on fan forced setting) for 20 mins. Lay down some waxed baking paper (or aluminium foil) on a baking sheet (or roasting pan). Then place the marinated rack of ribs. Splash some marinade around the ribs but discard most of sauce. Cook it for 8 hrs. Take the meat out and carve. Serve. ** The calorie value is for a single serving of the entire dish. Hello Sue! If I get my ribs boneless, does that affect cook time in the oven? Thanks! Hi Alexis, I would think so. Boneless ribs will cook faster. Make sure you don’t overcook it as it can go drier particularly without the bones. Often I find these marinades too sweet. What would be suggested adjustment for sugar where that is a concern, especially bc there is juice from apple added in this marinade? Also I would think 4 hour marinade time opposed to 24 hour marinade would also help there. Thanks so much ! Finally, if you want to marinate it only for 4 hours, that’s fine. But I don’t think it will absorb the full flavor of marinade. Unlike bulgogi, ribs are thicker, so it will take longer to get marinated well. My oven doesn’t have a fan option. Will it still work to cook at 212°F? As a general rule, many baking recipes drop the temperature by 20°C / 68F if using fan-forced oven to imitate conventional. However, I would still cook at 212F if I’m using my oven. Seriously each oven is so different nowadays, I don’t think there’s one straight answer. For example, my 4 months old oven needs to be set at a same temperature whether it’s fan-forced or conventional. Otherwise, the food won’t cook the same way. Can you clarify if you’re using spare ribs or short ribs? I went to the butcher asking for beef spare ribs and they said spare ribs can only be pork. If I want beef ribs they have to be short ribs. That’s interesting! I used beef spare ribs. (Maybe it’s called like that only in this country.) Also, reading this post might help your understanding. Perfect idea. I made it for my folks and family on this weekend, delicious, and simple to get ready. Thanks for the recipe. OMG!!! 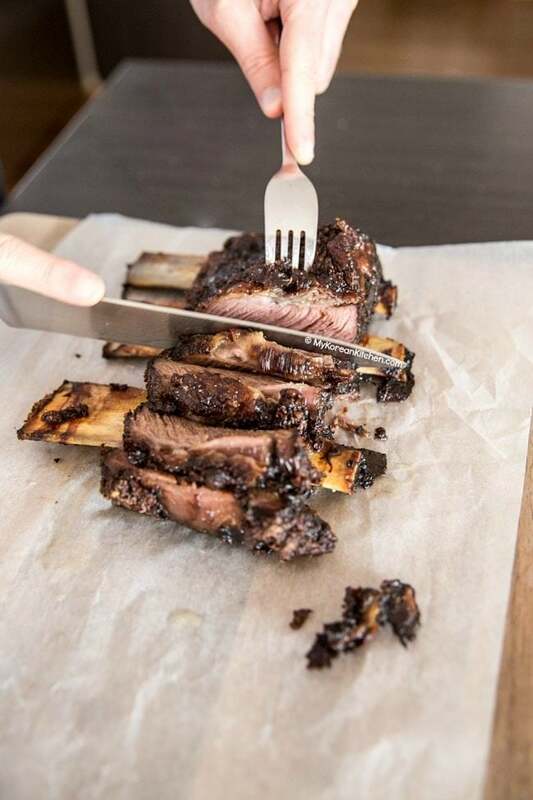 Your beef ribs are finger licking delicious looking!! Cannot wait to try them out! Thanks very much for the post!! I usually buy ribs and Sempio Kalbi sauce and then sprinkle japlapenos prior to going in the oven. I will try this recipe. Thank you for this recipe, my kids love them. Thanks for sharing this delicious recipe. Keep it up. Hi Sue. Thank you for sharing this delicious recipe. I prepared the ribs exactly as you instructed. This is now one of my go-to recipes! Hi Sue. 8 hours in oven is a long time to bake… if im using pork ribs, can reduce the cooking time? Hi Lee, the cooking time will shorten if you use lean / thiner meat. As an example, baby back ribs might get ready in 6 hrs instead of 8 hrs. Though, I much prefer using spare ribs as they result in more tender and juicier meat. I don’t believe changing the meat type (beef to pork) will have much impact in cooking time. this recipe looks fantastic! regarding the apples/ Asian pear dosnt mention how to handle them? slice, puree, leave whlole?! thanks! Hi Sarah, You blend all marinade ingredients (incl. pear) until pureed either using a food processor or a blender. Enjoy! Could I do this with pork? It sounds so good but I can’t eat beef. I think it should work with pork too! Enjoy! Do you cover the ribs while they’re cooking in the oven? Oh my! 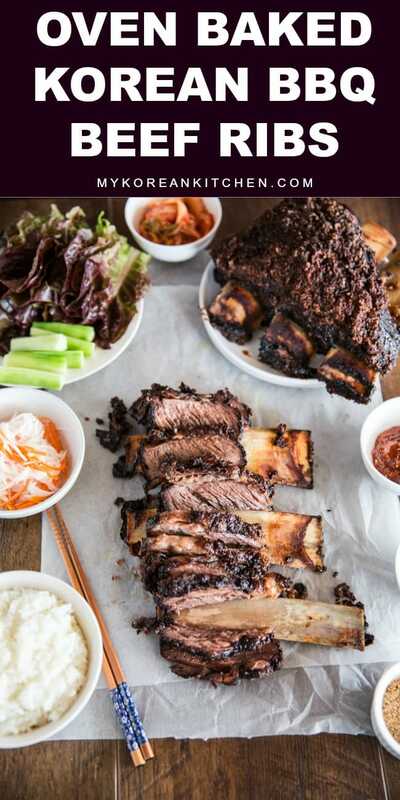 These Korean Beef Ribs look finger licking good. Yes, they will be perfect for parties and gathering. Can’t wait to try them. Thanks for sharing. I knew someone would use this recipe in a crockpot. 🙂 Great to hear that it worked out well!